Peter Bryer: Mobile Foresight: The internet of pills. New high-tech pillboxes are very smart, very proactive, and very well connected. The internet of pills. New high-tech pillboxes are very smart, very proactive, and very well connected. I came across an interesting article at the very useful Mobihealthnews site about the growing number of connected pillboxes and pillbox caps available on the market. I must say: this is truly a pragmatic use of connecting things. Here is one product example: GlowCap from a company called Vitality, glows orange as a reminder when it is time to take medication and can also make a chirping sound and even send out updates via e-mail, texts, or make a robocall. Apparently it can be very tenacious. 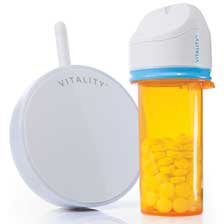 GlowCap also tracks use over time in a journal and can even connect automatically with the pharmacist when it is time for a prescription refill. GlowCap retails for a reasonable $10 to $75 or so in the U.S. but it does require an on-going service plan which costs $15 per month. That's a nice recurring revenue stream for several players, and does appear a bit costly at first. However, the value of the service could be well worth it for certain demographics. Here is a case where the internet of things can really be just what the doctor ordered. I don't want to seem like a pill pusher here, but this can really be an interesting device + service for some. Price is around $60 in the U.S. are major retailers.